No matter how many cigarettes you smoke or how long you have been smoking, this unique, entirely safe laser program can help you achieve your goal of stopping smoking without the withdrawal symptoms and nicotine cravings normally associated with breaking the habit. Many people who really want to stop smoking are afraid that they won’t be able to cope with certain situations without a cigarette or are defeated by the nicotine craving and withdrawal symptoms of the first few weeks.Our Laser Therapy program will help relieve you of these cravings and keep you relaxed, calm and happy during those first crucial weeks. This has been proven to be far more effective than ordinary treatments. Like thousands of previous clients, you too will be amazed at how easily you can stop smoking with the help of laser therapy. My wife and I came to Dr. Will for his Smoking Cessation Laser Program. I used to smoke four packs a day, my wife two packs. After his program we had no desire to smoke. Just recently celebrating three years smoke free, we are thankful to Dr. Will for all their help. Laser Therapy is entirely safe and pain-free. A soft laser beam, applied to specific energy points of your body, stimulates the body’s production of endorphins. These are the natural body chemicals that have a calming, relaxing effect. When you stop smoking, it is primarily the sudden drop in endorphins levels that leads to withdrawal symptoms and physical cravings. Laser therapy ill help relieve you of theses cravings as well as helping with stress reduction and lung detoxification. The treatment gives you a natural high with sense of well being, thereby greatly reducing the temptation to take another cigarette. As a result thousands of people have stopped smoking thanks to the laser therapy. Pilot studies, funded by the NHS, indicated that it is statistically by far the most effective method of stopping smoking. I came in a year ago for the Smoking Program with Dr Will. I was smoking about a pack and a half a day before my first visit. After that very first visit, I had no need for a cigarette and to this day I still do not. It’s been a year and I am so happy I made the decision to do the program. I feel great and do not miss smoking at all. The main treatment program is over 2 days. On the first day you will receive a consultation followed by your first one-hour laser treatment. The following you will receive a second relaxing laser treatment plus time to review your progress. A further treatment is available if necessary. All treatments are private and confidential and will be carried out by one of our fully trained therapists. 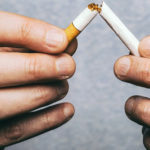 Of course, even if relieved of the physical craving of withdrawal from nicotine, many ex-smokers will initially be tempted to smoke because they find themselves stressed or simply because they associate certain activities with smoking a cigarette. It is to help with the mental side of the addiction that we will provide advice on helping you to adjust to being a non-smoker. We will also help you deal with the emotional, physical and psychological aspects of stopping smoking. 20 Minutes after stopping smoking the blood pressure and pulse return to normal. 8 Hours later nicotine and carbon monoxide levels in the blood have halved, while oxygen levels in the blood return to normal. 24 Hours later carbon monoxide has been eliminated form the body and lungs start to clear out the debris. 48 Hours later no nicotine is left in the body and the senses of taste and smell improve. STOP SMOKING FOR GOOD! GET STARTED TODAY! TESTIMONIALS FROM PEOPLE WHO HAVE USED THIS PROGRAM TO QUIT SMOKING. Our Laser Stop Smoking program has helped many people to stop smoking. Michael has just crossed his fifth year smoke free thanks to our program. DENISE HAS STOPPED SMOKING FOR 6 MONTHS, AND IS STILL GOING STRONG! Denise left a note on our Facebook Page to let us know that it has been 6 months since she completed the Laser Stop smoking program and she is still going strong! FROM $175 PER WEEK IN CIGARETTES TO ZERO! Gracie went from spending $175 per week in cigarettes to $0 using the Laser Stop Smoking program! Click here to read about Laser allergy relief.